Russian President Vladimir Putin has suggested using the period of U.S. and EU sanctions against the country to increase the competitiveness of the Russian economy, with a thrust planned to improve the competitiveness of the real sector in the next one and half to two years. Analysts are divided on whether this objective is attainable. 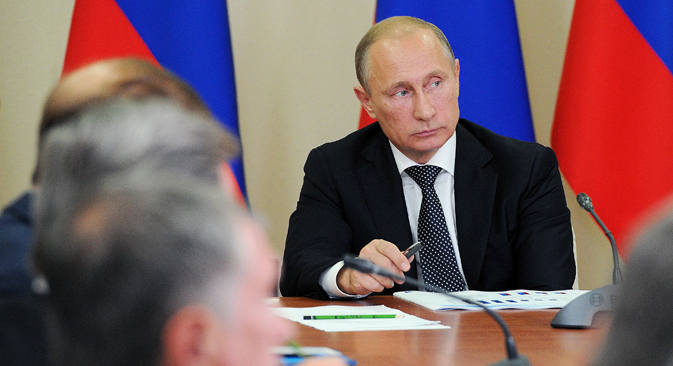 During a session of the State Council on Sept. 18, Russian President Vladimir Putin suggested that the sanctions could be turned to Russia’s advantage by increasing the competitiveness of the Russian economy, focusing on gross domestic and national product, consumption, savings, and capital formation, or the real sector. "In the next one and a half to two years it is necessary to take a real leap in the improvement of the real sector's competitiveness. Doing something that in the past would have taken years to do," he announced. According to Putin, the efforts of all federal and regional government organs must be oriented towards the development of the real sector. In particular, key instruments must be accessible credits and new competitive conditions for financing business. In general, the Russian government plans on using the domestic market in order to develop the real sector. "The competitiveness of Russian enterprises will directly depend on whether they will be able to put out a sufficient quantity of production that will not be inferior to foreign production in price and quality," Putin explained. In his words, "we need to use one of the country's most important competitive edges: the capacious domestic market." It needs to be filled with quality goods made by the real sector, while maintaining the economy's stability and equilibrium, according to Putin. Experts reacted to the president's words with caution. "Talk of accessible credit has been around in Russia since the fall of the USSR, but enterprises have still not received it," says Anton Soroko, analyst at the Finam Investment Holding. “Furthermore, the situation in Ukraine has not helped. Therefore, in the near future we must start anew." According to Soroko, the opaqueness of the institutional environment can easily neutralize practically any monetary flows into the country. Chief Economist on Russia and the CIS countries at the Bank of America Merrill Lynch Vladimir Osakovsky is also not counting on the growth of the Russian economy in the near future. "We expect that the macroeconomic situation in Russia will worsen as a result of the accelerating inflation caused by the restrictions on food imports, the fall of consumption and the volume of investment, as well as the reduction of exports," the RBC business daily cites Osakovsky as saying. According to Osakovsky's new forecast, in the second part of 2014 and the first half of 2015 Russia will sink into a recession, which will be followed by a recovery generated, mainly, by the base effect. Alexei Kozlov, chief analyst of UFS IC, has a different opinion. "The proposal to accelerate the development of the Russian economy that we heard during the State Council session is completely realistic," he says. According to him, the objectives have a maximalist character, but without setting such high goals, it is impossible to make a radical change in the way the Russian economy functions. "On the whole, Russia has been voicing its aim to reduce its raw material dependence for a long time," remarks Kozlov. "In light of the recent events, this goal has been expanded and is now attainable." Russian industrial enterprises are continuing to show positive economic signs. According to data collected in September by the Gaidar Institute of Economical Policy (IEP), short-term investment expectations in the industrial sector are still high, on a par with those of 2012. Moreover, the institute's "industrial optimism index" practically reached a three-year maximum in September 2014. The institute believes that it is highly likely that this month a growth in production output will be recorded. In the first half of the year the growth of industrial production was 1.5 percent in comparison with the same period in 2013, while GDP grew by almost twice as less: 0.8 percent. According to a study carried out by the Higher School of Economics, the last time this happened was in 2010-2011, during the phase of reserves accumulation. However, in this case growth depends completely on state orders. For the time being, according to experts, only a certain industrial sector is witnessing growth: the production of vessels, aircrafts, spacecraft and other means of transportation. This industrial segment also includes the production of railroad cars, airplanes, helicopters, submarines and so on, that is, a substantial part of transportation bought by the government and by state companies, including military technology. Production in this sector has been growing since the middle of 2013, and in 2014 it drastically increased. While at the end of 2013 this subsector's contribution was only 0.1 percent of the growth of industrial production (out of 0.4 percent of growth), in the period between January and August 2014 it was already 0.7 percent out of 1.3 percent, which is more than half. This means that this year industrial growth was fully conditioned by state demand, according to the Higher School of Economics.